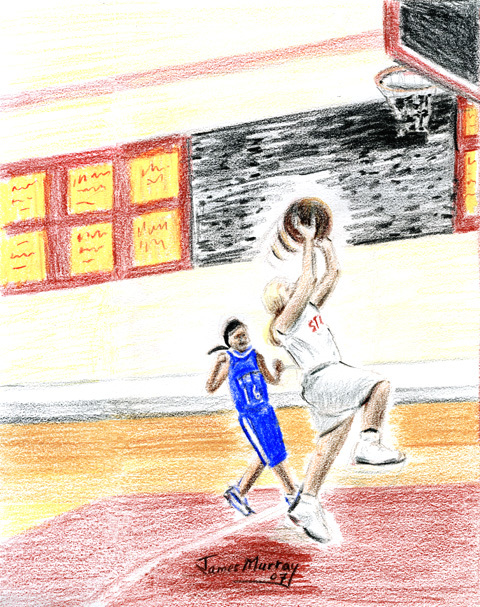 This second portrait of Chelsy (wearing the white jersey) shows her in action during a junior high school basketball game. The drawing is rendered in coloured pencil on paper. View her previous or first portrait. Graphic File Format: JPEG. Dimensions: 480 x 607 pixels. Date: 2007. Browsing Samples: Browse other poster samples by clicking the Previous. You may also click on a link in the Portfolio Directory below.